LEHIGH VALLEY, PA – As of November 1, Lehigh Valley Arts Council appointed South Bethlehem native, Carlos M. Barata, as the new Pennsylvania Partners in Arts (PPA) Program Administrator. Barata will follow in the footsteps of Marilyn Roberts, a Lehigh Valley native who has served the region’s arts communities for over twenty years, the Lehigh Valley Arts Council for three. Barata is a graduate of Bethlehem Catholic High School, and Lafayette College, where he studied Music, Anthropology/Sociology, and Gender Studies. In addition to his role as an independent singer-songwriter and performer, his hands-on training and experience in music administration, communications, and event planning has afforded him positions throughout the Lehigh Valley with various organizations including Organizing for Action, ArtsQuest, Miller-Keystone Blood Center, and Klunk & Millan Advertising. Barata will assist in coordinating the PPA Program, a state funding initiative of the Pennsylvania Council on the Arts (PCA) designed to widen the circle of funding opportunities in support of arts activities throughout 67 counties. 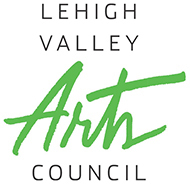 The Lehigh Valley Arts Council is entering its 11th year as the PCA’s regional partner of the PPA by re-granting state funds to applicants in Carbon, Lehigh and Northampton counties through two streams of funding opportunities, Project Stream and Program Stream, which both expand community access and encourage local decision-making. The grant application and award process is administered by the Arts Council staff, who convene advisory panels from the cultural community to review the proposals. Panelists, selected to review applications according to guidelines provided by the PCA, provide the essential expertise, integrity, and commitment to the arts in the community. Searching will take place at Bustard’s Christmas Trees, the 2015 National Christmas Tree Association Grand Champion winner of the national tree contest. Glenn & Jay Bustard and their family will present the White House Christmas Tree in November/December. The tree will be displayed in the Blue Room. Harvest of the selected tree will take place just prior to the presentation. Winners of the National Christmas Tree Association national tree contest have provided the official White House Christmas Tree since 1966. ADDITIONAL: Interviews or background information requests may be directed to Rick Dungey in the NCTA office at (636) 449-5071 or email to dungey@realchristmastrees.org. If you like wine, tapas and music.. you’re going to love our must-attend, premier event! Calling all wine-lovers and cheer-givers! Celebrate with us and sample a variety of vino at our 2-day, Wine Me Up Festival atop PA’s highest vertical. Plus, an exclusive Preview Night on Friday if you can’t wait for the weekend! A VIP Goody Bag and Complimentary Valet Parking! A Commemorative Wine Glass for sampling! The Bach and Handel Chorale, founded in 1984 and based in Jim Thorpe, Pennsylvania, will celebrate 30 years of bringing choral and orchestral music to Carbon County and surrounding area. The program will feature music for orchestra and choir by Telemann, Bach, Handel, and will conclude with the first public performance of “We Sing of God” written by founder and conductor, Randall Douglas Perry. 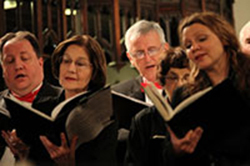 During the intermission, the chorale members will host a reception with light refreshments for patrons and audience members in the Great Hall of the church. This year the Chorale is proud to celebrate it’s 30th year with it’s Anniversary Concert featuring the talented Festival Orchestra. The Chorale now has singers ranging from 15 to 70 years in age representing Carbon, Lehigh, and Schuylkill Counties. These singer’s voices culminate with stunning orchestral sounds to create a feast for the ears!!! BUY $9.99 RUSH TICKETS TODAY! Saturday ≈ April 26, 2014 ≈ 3:00 p.m.
Allentown, PA – Pennsylvania Partners in the Arts (PPA) is a partnership connecting local artists and nonprofit organizations to the Pennsylvania Council on the Arts (PCA). PPA re-grants state funds to support a wide variety of local and community arts activities through its regional partners; Lehigh Valley Arts Council is entering its 10th year as the PPA Partner who administers these funds in Lehigh, Northampton, and Carbon County. The PPA 2014-2015 Project Stream will provide funds of up to $2,500 to eligible individuals, community groups, and non-profit organizations to conduct arts projects. These projects must take place between September 1, 2014 and August 31, 2015, and each project (a single event or a series of activities) must have a significant public component. PPA Project Stream applications are reviewed by an invited panel of Lehigh Valley artists and arts advocates according to criteria provided by the Pennsylvania Council on the Arts. The Lehigh Valley Arts Council has accepted project grant requests from as many as 60 applicants in one cycle; and in the most recent fiscal year, we awarded grants to 24 projects. Activities successfully receiving PPA project funding have reached a wide range of constituents, from young children to senior citizens, and this year’s projects are engaging audiences in activities that include visual arts exhibitions; photography; musical performances from opera to jazz; documentary film; storytelling and dance. Visit http://www.lvartscouncil.org/programs for more details on the award recipients and their projects. May 15th: Mauch Chunk Opera House in Jim Thorpe, noon to 2 pm. Conversations will include a review of the grant application, plans for constructing your narratives and budgets, and expectations for best practices for preparing work samples and supplemental materials. There will be an additional drop-in session for applicants to review their progress on June 3rd, from 11:30 am – 4:30 pm in our office at 9th & Hamilton Streets in Allentown. Attendees are encouraged to bring ideas, plans, and questions. Email Marilyn J. Roberts, PPA Coordinator, ppa@lvartscouncil.org or call 610-437-5915 to share your interest in applying for a Project Stream Grant and attending one of these beneficial workshops. Include your organization and/or artist name, preferred email address, and a brief description of the project you are considering as well as your choice of workshop. Link to the PCA’s eGRANT website after May 1st (http://ppa.egrant.net) to register on the application site and to access news about current PPA grant applications. June 20th, 2014 is the deadline to submit Project Stream Applications to the PCA electronically and to postmark the required forms and supplemental materials to the Lehigh Valley Arts Council. Calling all artists, community groups and arts organizations! The Lehigh Valley Arts Council invites you to apply for up to $2,500 from the Pennsylvania Partners in the Arts Project Stream to fund arts projects or activities benefiting the communities of Carbon, Lehigh and Northampton counties. Anyone interested in applying is encouraged to join us for one of our free PPA grant workshops. Mark your Calendar! The PPA deadline for Project Stream Applications is June 20th, 2014! The body of a Tamaqua woman was discovered Saturday morning by firefighters in Jim Thorpe working to extinguish a brush fire, a relative of the woman said Sunday night. According to Donald R. Serfass of Tamaqua, it was the body of his niece, Angela Serfass Steigerwalt, 35. “She grew up in Tamaqua and went to Tamaqua high school. She worked at Kraft Foods down in the Lehigh Valley. She worked in inventory control. She was very clean cut. She supported animal rights causes, anything having to do with the welfare of animals,” Serfass said. A snowstorm headed toward the Lehigh Valley will likely fall short of becoming a blizzard locally, but meteorologists are expecting heavy snow to arrive Thursday evening and Friday morning. The National Weather Service is putting out a winter storm warning for Lehigh, Northampton and Warren counties. The three counties under the warning could face 6 to 10 inches of snow and wind gusts ranging from 15 to 25 miles an hour, according to the weather service. Snow is expected to start around 1 p.m. in the three counties, according to the service. The same report placed Hunterdon County under a winter storm watch, saying it could see 3 to 7 inches of snow beginning around 2 p.m. The surviving sons of the famous American Indian athlete have long fought to get the remains of their father moved from Jim Thorpe, Pa., to tribal lands in Oklahoma, where he was born, and they recently won a crucial legal victory that put them close to their goal. But Jim Thorpe isn’t letting its Olympian namesake go without a fight. Residents and business owners are helping to raise money for the town’s appeal to be filed later this month saying they have honored, appreciated and respected a man long considered one of the 20th century’s best athletes. Hence the donation jar on the counter of Fitzpatrick’s gift shop, prominently displayed between the cash register and a rack of cat figurines. Jim Thorpe Borough Council has voted to appeal a federal judge’s order to relinquish the famed athlete’s remains so they can be reinterred on American Indian land in Oklahoma. Thorpe’s sons sued the borough claiming the town amounts to a museum under the 1990 Native American Graves Protection and Repatriation Act (NAGPRA). Jim Thorpe council met on Thursday and voted 6-0, with Councilman Jay Miller absent for a medical reason, to appeal a federal judge’s decision to comply with NAGPRA. “I feel council made the right decision,” Jim Thorpe Mayor Michael J. Sofranko said on Friday. JIM THORPE, PA – Stewart Counterman stopped by Jim Thorpe’s tomb Monday afternoon after hearing the legendary athlete’s body might soon be moved. Despite never having set foot in the town that now bears his name, the pro football pioneer and double-Olympic gold medalist provided the community a sense of purpose when it seemed to have none. In 1954, the struggling mining towns of Mauch Chunk and East Mauch Chunk were looking for a way to put themselves back on the map. They made a deal with Thorpe’s widow Patricia, united under Thorpe’s name, and gave him the fitting tribute and final resting place his native Oklahoma would not. Robert J. Hipp was enjoying his backyard fish pond Friday when he noticed something floating on the surface. Upon closer inspection, Hipp said, he saw a 3-foot-long American alligator enjoying a swim. But the gator was also feasting on fish and frogs in the pond. I drove up to Jim Thorpe today thinking it would be cooler in the mountains (not) and because it is a funky place (this was not my first visit, hence I already knew it was funky). 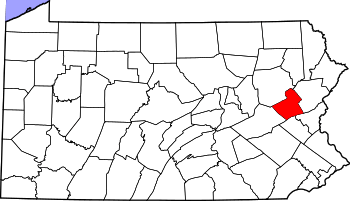 Jim Thorpe is the county seat of Carbon County. Carbon County has a total land area of 387 square miles and 65,249 residents, based on the 2010 Census (a population density of 171 persons per square mile). Jim Thorpe’s population was 4,804 (2000 census) with a land area of 14.5 square miles (mostly undeveloped, obviously). Carbon County borders Lehigh County to the south and Luzerne County to the north. 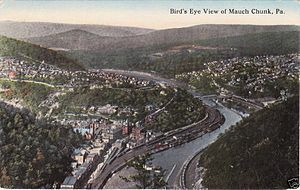 Jim Thorpe was originally two towns across the Lehigh River from one another – Mauch Chunk and East Mauch Chunk. The two towns merged and adopted the name Jim Thorpe, after famed Native American Olympian Jim Thorpe who is buried in the borough. Originally, what is now Jim Thorpe was a railroad and coal-shipping center. Like many Pennsylvania towns, Jim Thorpe found itself on the downside of post-industrialization and languished for many years. Becoming Jim Thorpe was the first attempt to boost the local economy. This offered only limited success and so the town leadership needed to find other means of ramping up their economy. Today, Jim Thorpe is a bustling small town that has become a destination (are we paying attention Pottstown?) using its natural surrounding, its heritage and some good marketing. Jim Thorpe has capitalized on being a former railroad town. You can take an awesome train ride along the Lehigh River. During the trip you learn about local history, play games and answer questions. It is very enjoyable and affordable. Asa Packer and his son Harry Packer have mansions in Jim Thorpe. Asa’s mansion is a museum and Harry’s mansion is a B&B. Asa Packer founded the Lehigh Valley Railroad and Lehigh University. Jim Thorpe is a river town. The Lehigh River runs between both sides of town. Taking advantage of being a river town, Jim Thorpe offers whitewater rafting on the Lehigh. Jim Thorpe is also a mountain town. It’s called the “Switzerland of America”. Taking advantage of being in the mountains, the town offers mountain biking and hiking. They threw in paintball just because. And don’t forget the Anthracite Triathlon, paying homage to being a coal-shipping center and part of the Coal Region. Jim Thorpe is a historic town, full of 19th century architecture. One can see examples of Federalist, Greek Revival, Second Empire, Romanesque Revival, Queen Anne and Richardsonian Romanesque. St. Mark’s Episcopal Church, the Carbon County Courthouse, the Packer Mansions, the Train Station, the Hotel Switzerland, historic Broadway, the Lehigh Coal & Navigation Building and the Carbon County jail are some of the architectural attractions in town. Jim Thorpe is so cool. How cool is it?? Jim Thorpe was listed as number 7 on Budget Travel magazine’s America’s Coolest Small Towns in 2009. Downtown Jim Thorpe is full of restaurants, bars, boutiques and stores of all kinds. No empty buildings or mental health drop-in center. Everything is clean and neat. There is signage every where so you can find your way. There is plenty of cheap parking…you have to pay but it is only a few dollars for the day. There is plenty of foot and vehicular traffic coursing through the downtown. Keep in mind this town has 4,804 people (or there about – not finding 2010 census results yet) and their downtown puts Pottstown’s to shame. What’s wrong with that picture? Jim Thorpe is 4 ½ time smaller than Pottstown, off the beaten path (Carbon County is not exactly Montgomery County with 800,000 people) and yet this town still finds ways to revitalize and thrive, even in a bad economy. Would you suppose the Mayor of Jim Thorpe nuzzles the ear of the Carbon County Commissioners at local events and undermines the borough council’s downtown revitalization strategy and possibly harms a local business? Would you suppose the Mayor of Jim Thorpe goes on the local radio station and bad-mouths borough council or that his/her spouse calls borough council a bunch of idiots while storming out of a meeting? Would you suppose the Mayor of Jim Thorpe blows off out-of-town visitors and embarrasses borough council by promising to do something and then not doing it? What do you suppose Jim Thorpe’s secret it? Would you think the borough leadership came up with a plan and sticks with it? Would you think there is a vision for Jim Thorpe and that the leadership works together and speaks with one voice? Would you think taking advantage of a town’s history and natural surroundings is as good idea? Would you think creating a destination environment to attract repeat visitors is a good strategy? Do you think embracing art and culture is a good strategy? Jim Thorpe does. Obviously, we are doing something very wrong in Pottstown that we are put to shame by a little mountain town in rural Carbon County. They have left us in the dust.